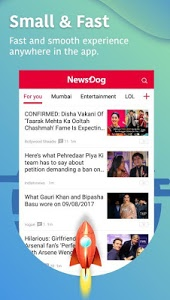 NewsDog, one of the most popular and interesting apps in India, brings you the latest trending stories, interesting videos, WhatsApp status as well as Hindi news, breaking news, Alert News in India from 680+ cities and content from different categories like politics, cricket, Tech, Business and more. Stay updated with trending news, videos & LIVE cricket score on India’s best news app. - ? Cash Rewards, Join event to earn extra money by inviting friends, sharing apps and more. - ? Trending News, Anytime, Anywhere! Read local news in 10 languages! - ? News just for you, India's Smallest & Fastest News APP! - ?? All breaking news and top stories from India and around the World. - ? Offline Reading, Store the categories you like offline and enjoy your content on the go. - ? Smooth on 2G/3G/4G/Wifi networks with Adaptive bitrate technology. NewsDog keeps you up to date with the latest news, breaking news & developing stories, headlines of today, local news & world news. Enjoy all-in-one news from NewsDog, Cricket Livescore, Bollywood news, India News & more. 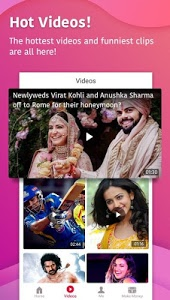 Never be bored again with a great mix of free videos, including funny videos, viral videos, news videos, movie clips, TV shows clips, music videos, hindi video songs, etc. You can get a huge collection of funny content including funny cats and dogs, movie clips from a wide range of funny apps and sources. Share your favorite on Facebook and WhatsApp. Miss Bollywood is now online! Catch up on the latest news from the world of entertainment. You can now stream all the events from Bollywood and Tollywood. Hottest gossip, Bollywood movies, scandals on celebrities. More than 40,000 Exclusive pictures of your favorite national and international celebrities. Let your eyes have a feast! Find live local news and timely weather forecast. 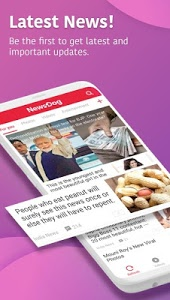 No matter you are looking for Delhi news, Mumbai news, Ahmedabad news or Kolkata news, Bihar news, UP news, NewsDog can always offer you news just around you in the most natural way. Read top news on the performance of Indian cricket team in every Champions Trophy match! Be the first-to-know of cricket news, upcoming match schedules, game prediction, live update, game result of every cricket game. And also cricket buzz, player trade cricket videos and IPL scores. NewsDog can provide you with personalized news feed from over 1,000 trusted news sources national and worldwide. 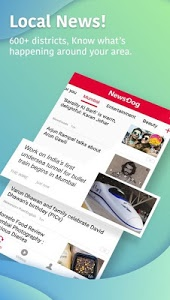 With all the features, reading news with NewsDog is fun and addictive! 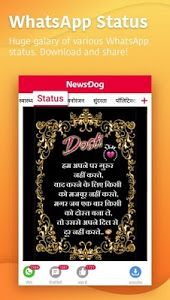 NewsDog is the SMALLEST and FASTEST India news app that keeps you informed of a variety of daily India news in Hindi, Tamil, Telugu, Marathi, Punjab，Malayalam, Kannada, Gujarati, Bengali along with English. It brings you millions of latest news such as India news, local news, lifestyle news, cricket news, Bollywood news, horoscope, job news, weather forecast, car news, tech news, beauty tips and more. You can also get news in your area such as UP news, Bihar news, Delhi news, Lucknow news and Kanpur news. 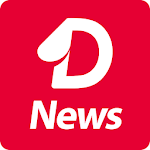 Download NewsDog today and stay updated with top news around you. Please get in touch with us to share your valuable feedback, ideas & get help using the app. If you enjoy using the app, do give us a 5 star rating! Better UI design with more user-friendly interface. Similar to "NewsDog - Viral Video, Hot Story, WhatsApp Status"